I (we) finally started working on my table I have been dreaming of for months. I really wanted to make it on my own, but Eric has kind of hijacked the project.But the boards are heavy and it is easier to work with two people, so I am glad for the help. We are making it out our spruce, anything else we would have had to special order. The workshop. My car has to live outside for a few days. 4x4's for the legs. 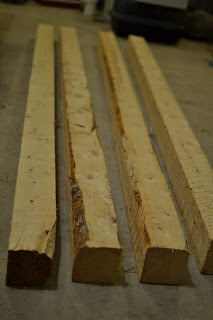 We couldn't get these from the lumber yard, they only sell treated 4x4s so we got these direct from the mill. They are really rough, but I am excited about the character they will add to the table. The table top, all kreg jigged and ready to assemble. We cut the boards yesterday, and assembled it today. It has proven quite the challenge, but I never thought this would be super easy. And it is going to be well worth the hard work. The beauty of this table is I don't want it to be perfect. I want it to look rustic and home made. I don't want it to be polished and smoothed and perfect. In fact last night we took a hammer and screwdriver to the top to roughen it up a bit! I can't wait for it to be finished. It is going to be SUPER heavy, so we will probably move it in two pieces and put the top and the base together in the house! SO exciting - can't wait to see the finished product!! awesome! i love stuff like that! i saw a table on pinterest made out of an old barn door and i LOVED it!